international market research for you. Whichever country you are targeting, we give you the lowdown on its trends, culture, internet usage, consumer wants and needs and more. Our marketers will tell you how to approach a foreign audience and give you a rundown of what works and what doesn’t in that particular locale. We focus on providing you with the best solution for your business to ensure a smooth, profitable entrance into a new territory. Communicating across cultures can be challenging. It’s important that you know how to approach your target market. Are you aware of its individual norms, rules, beliefs, values, and characteristics? To successfully localize your brand and “speak the same language” as your customers, you need to perform market research. Thankfully, you can leave it to the professionals – Pangea’s team is here to do it for you. Pangea’s market research will help you better understand your target market and make you culturally sensitive when offering your services to them. • What are the customs and values in your target market? • Is there a demand for your product / service in that country? • What has your competition done in the same territory? Whether you want to target the Asian or Eastern European sector, our marketers are local, native and experienced in their language and own domestic market. We have an increased understanding of each individual territory, helping you better tailor your brand for that market. We define your market, perform market analysis and build a structured and strategic approach for your international growth. 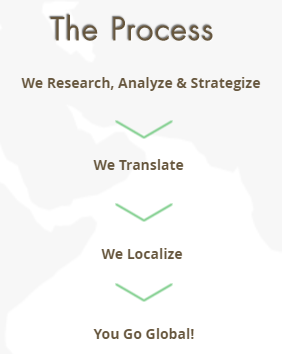 Once we’ve performed the market research, we then translate and localize your content so that it is market-related. Who Do We Perform Market Research For? What’s Involved in Market Research?